Whittel & Melton, LLC is a Palm Beach County personal injury law firm with a stellar client services reputation and a proven track record of fighting for victims of catastrophic injury throughout the state of Florida. If you have been involved in an accident, our attorneys are here to help. By calling our office, our Boca Raton Personal Injury Attorneys can assist in you sorting out your case, offering options to help you through this difficult time. During the free case evaluation, our Delray Beach Accident Attorneys will collect valuable information about your claim. You will receive legal advice and an understanding of whether you can file an insurance claim as well as a range of financial compensation you may expect to receive. Once retained, we will work tirelessly to hold wrongdoers as well as insurance companies responsible for your injuries. We will also coordinate with doctors and other health care professionals to help you on a path towards healing, even if you do not have health insurance. The Palm Beach County Personal Injury Attorneys at Whittel & Melton work on a contingent fee basis--meaning that we will not collect any payment for our services unless we secure a settlement on your behalf. You have nothing to lose by consulting an experienced personal injury lawyer from our office regarding your case. Contact us online or call us TODAY is discuss your case with one of our attorneys. 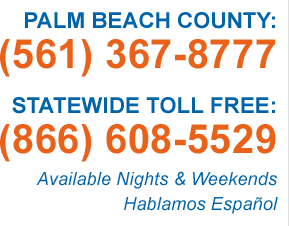 Local (561) 367-8777 or statewide, toll-free: (866) 608-5529 Toll-free: (866) 608-5529.